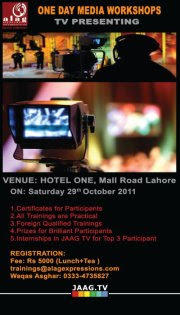 The reason for offering workshop is to provide the basic but comprehensive knowledge to participants about Tv Presenting/Anchoring/tv host in one day session.Persons who are passionate to be anchor or host thid work shop will help them to have some technical know how about the trainings. After taking this workshop they will be able to understand their fields of interest? Workshop offering reason is to people make understand that how media professionals work actually. To tell them reality as well that how demanding this work is? This is important because they are investing their money on doing their ideas and especially their time. So they must be told right direction so that they are able to choose media as their professional career. •One who have passion to do work in media as a TV Anchor / Presenter. There is no age limit to attend any workshop organized by Alag Expressions.